"A lot of entertainers today are NOT very creative. They do programs-in-a-box without even changing the program title. Now, at last, you CAN learn to be more creative & original! This trilogy of books can show you how to generate more ideas and turn them into reality! I’m actually in the process of reading these books a second time! They are that good! You WILL NOT be disappointed! "Volume 1 Yes, you CAN be creative! This book guides you through an explanation of the creative process so you can learn to use it more effectively. "Learn to write your OWN material so it expresses your unique personality. Reading this book will help you generate new ideas and then turn those ideas into reality. "Find the answers to such questions as: What is Creativity? Why Should I Be Creative? And more! Companies spend hundreds of dollars each year to learn to be more creative. Won’t you spend $26.00 to learn? "Volume 2 This book is filled with tools that will inspire both a greater number of ideas and a wider variety of ideas. Topics include Ask Questions, Brainstorming, Mind Mapping, Reading , Play, Improv and much more! I found this book to be fascinating reading. Bruce is an exceptional writer. "Volume 3 I’m even mentioned on page 315. This is an amazing book filled with wonderful ideas! Here in one book are tons of actual routines and the thinking behind them. This book brings into focus the thinking and ideas laid out by the two earlier books. "Rating 10+ These books should be in EVERY performer’s library!" Are you creative? Do you want to be more creative? This 280 page book by Bruce “Charlie” Johnson will give you ideas and exercises for entertainers (magicians, clowns, puppeteers) to become more creative. This book has 21 chapters and includes a review, glossary, bibliography and index. 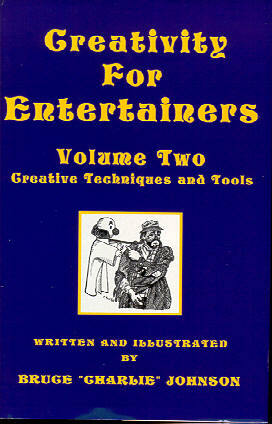 The book includes chapters on different types of creativity and how they apply to the field of entertainment. Our favorite part of the book was on page 100 when we read the section on adding safety messages to routines. The author used S.M.I.L.E. as the example. Thank you Bruce! There are two more volumes in this trilogy that you should check out. This is a good book that will spark your imagination. On our scale of 1-5 smiles, we give Creativity For Entertainers 4-3/4 smiles. “When Bruce ‘Charlie’ Johnson takes on a subject you know it will be well researched, clearly written and filled with fascinating anecdotes to keep it interesting. 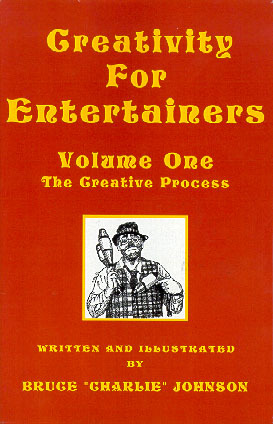 In the book Creativity For Entertainers Volume One, he takes on a subject that is dear to his heart and something that he is an expert at himself. This book is part one of a trilogy that is an encyclopedic masterpiece on the topic of bringing out creativity for entertainers. If you want to be a better entertainer, you need these books. It’s a home study course that will make you think and discover ways to improve your performance. “This book will help you explore the creative process and generate more and better ideas. This will improve your programs and delight your audiences… If you are in doubt about your creative ability, you really need this book. You will be delighted to discover how much creativity you have. Of course if you are already a creative minded person, this book will really light your fire. “You will discover so many techniques and ideas. He discusses how to take your ideas from inspiration to the actual finished stage. He gives good council on how to take risks and analyze your work. He covers audience reactions and offers performance tips. "I personally have read these books and highly recommend them for the serious performers." "I have finished reading your three Creativity For Entertainers books. I have been reviewing my notes. I will read the books again this Fall. 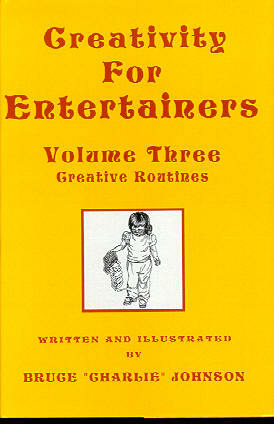 The Creativity For Entertainers Trilogy is available in two formats, Trade Paperback and Hardcover. International orders will be charged exact postage.